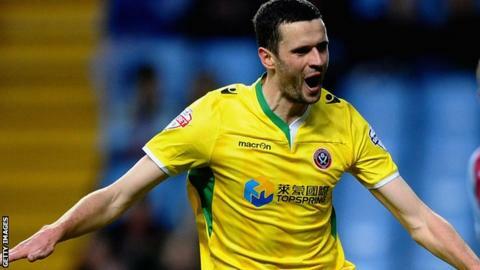 Chris Porter and Jamie Murphy scored late goals as Sheffield United battled from a goal down to beat Port Vale. Louis Dodds put Micky Adams's hosts ahead from close range after Adam Yates' low cross. Nigel Clough's side struggled to find a breakthrough until John Brayford escaped down the right to tee up Murphy for the equaliser. Porter scored a similar goal in the last minute after good work from Ryan Flynn to give the Blades three points. "It was hard fought, I thought we had to hang in there for long periods of the game and keep going right to the end, but I think it's indicative of the spirit of the team that we can go away from home and win a game in the last 10 minutes. "We got into good positions in the first half, but without the final pass or run. We had a lot of possession in the first half but couldn't break through. "That's why you keep doing the right things, right to the end; the passing, the runs forward and it's two tap-ins in the end." Match ends, Port Vale 1, Sheffield United 2. Second Half ends, Port Vale 1, Sheffield United 2. Chris Porter (Sheffield United) wins a free kick in the defensive half. Goal! Port Vale 1, Sheffield United 2. Chris Porter (Sheffield United) left footed shot from the centre of the box to the centre of the goal. Assisted by Ryan Flynn with a cross. Attempt saved. Jordan Hugill (Port Vale) left footed shot from outside the box is saved in the centre of the goal. Attempt saved. Jamie Murphy (Sheffield United) right footed shot from the left side of the box is saved in the centre of the goal. Substitution, Port Vale. Chris Shuker replaces Anthony Griffith. Corner, Sheffield United. Conceded by Sam Johnson. Goal! Port Vale 1, Sheffield United 1. Jamie Murphy (Sheffield United) right footed shot from the centre of the box to the bottom right corner. Assisted by Ryan Flynn with a cross. Jennison Myrie-Williams (Port Vale) wins a free kick on the right wing. Foul by Ben Davies (Sheffield United). Substitution, Sheffield United. Ben Davies replaces Conor Coady. Substitution, Port Vale. Ryan Lloyd replaces Louis Dodds. Substitution, Port Vale. Jordan Hugill replaces Ben Williamson. Attempt missed. Conor Coady (Sheffield United) left footed shot from outside the box is too high. Substitution, Sheffield United. Chris Porter replaces Jose Baxter. Corner, Port Vale. Conceded by John Brayford. Billy Knott (Port Vale) wins a free kick in the defensive half. Corner, Sheffield United. Conceded by Chris Robertson. Attempt saved. Billy Knott (Port Vale) left footed shot from outside the box is saved in the top centre of the goal. Conor Coady (Sheffield United) wins a free kick in the defensive half. Foul by Kieran Freeman (Sheffield United). Ben Williamson (Port Vale) wins a free kick in the defensive half. Attempt saved. Jose Baxter (Sheffield United) right footed shot from the left side of the box is saved in the bottom right corner. Corner, Sheffield United. Conceded by Richard Duffy. Chris Lines (Port Vale) wins a free kick in the attacking half. Chris Robertson (Port Vale) wins a free kick in the defensive half. Goal! Port Vale 1, Sheffield United 0. Louis Dodds (Port Vale) right footed shot from the centre of the box to the top right corner. Assisted by Adam Yates. Anthony Griffith (Port Vale) is shown the yellow card.